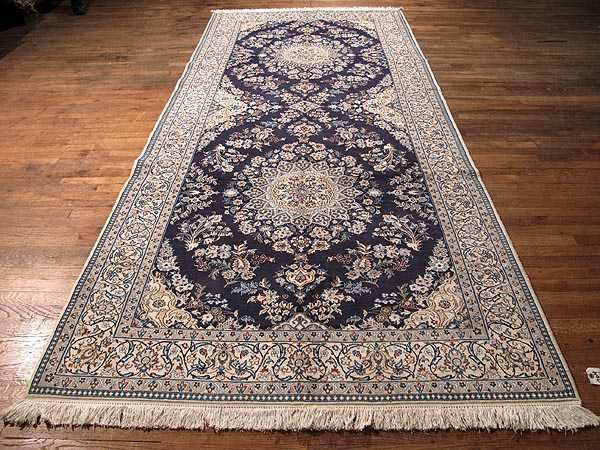 "Major elements like the navy background or the repeated medallion layout can be easily spotted for this Persian rug. This Nain style Persian rug contains a wonderful rosette motif decorated medallion. The mix of ivory, blue and brown over the navy background is extremely appropriate thanks to the accurate design's symmetry. Another authentic element is the main border surrounding the repeated medallion layout, which is decorated with a pattern of Shah Abassi motifs. The small flowers surrounding the main decorative elements have an emphasis effect over them."